이 책은 『춘추좌씨전』을 중국 송나라 임요수가 읽기 어려운 글자에 주를 달고 글 전체에 걸쳐 해설을 한 것으로 원래의 판본을 바탕으로 다시 새긴 것이다. 세종 13년(1431)에 전라도 관찰사 서선(徐選,1367∼1433)이 간행하였다. 이것의 간행작업은 세종 12년(1430)에 전라도관찰사 신개(1373∼1446)가 집안에서 소장하고 있던 본을 간행하여 널리 펴내고자 도사 김치명과 의논하여 그 해에 금산에서 판을 새길 것을 알리고, 다른 군에서는 구재모공의 협조를 지시하여 실시되었다. 하지만 그는 세종 12년(1430)에 대사헌으로 전직됨에 따라 완성을 보지 못하고 후임 관찰사 서선이 그 간행을 이어받아 세종 13년(1431)에 완성하였다. 지방관에서 새겨 비교적 새김이 정교하고, 초기에 인쇄된 것으로 원래 판본의 특징을 잘 나타내고 있다. 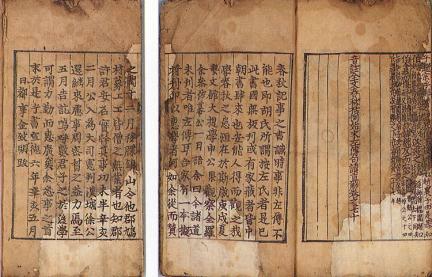 This book was compiled by Song Dynasty’s Lin Yaosou, who added footnotes and annotations to Zuozhuan (Zuo Commentary on the Spring and Autumn Annals). 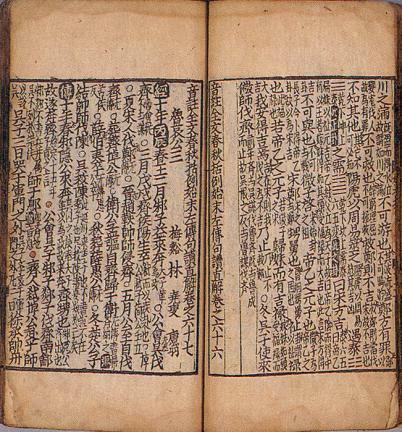 In 1430 (12th year of the reign of King Sejong of the Joseon Dynasty), Sin Gae (1373-1446), a governor of Jeolla-do Province, discussed with inspector Kim Chi-myeong regarding the publishing and circulation of the book, which was kept at his house, and announced the engraving of its printing blocks in Geumsan that same year. The materials and artisans for the work came from the other regions. Note, however, that he did not see the completion of the project because his occupation was changed to daesaheon (inspector-general) in 1430; thus, his successor, Seo Seon (1367-1433), took over the project and completed it in 1431 (13th year of King Sejong’s reign).